Marlene offers you full cover while still enhancing your silhouette in a visually enticing manner. 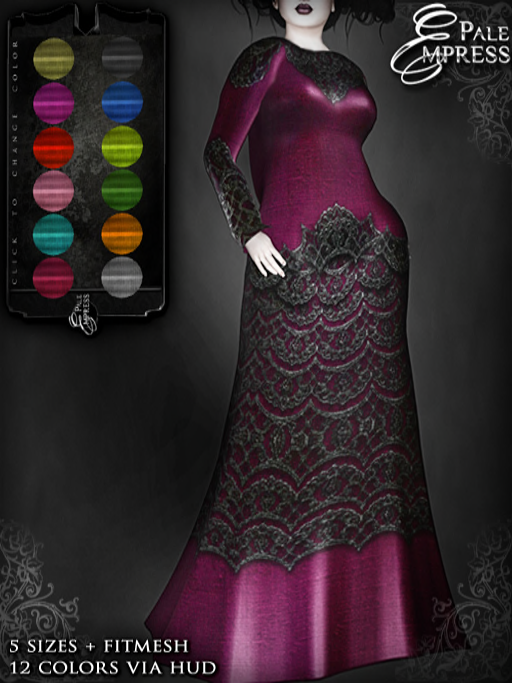 The full length gown has also long sleeves and a very modest neckline. Instead of relying on revealed skin, the dress teases the eye with the placement of the black lace, darkening the look and bringing the focus to the center, to the curves left free of the more pronounced material. 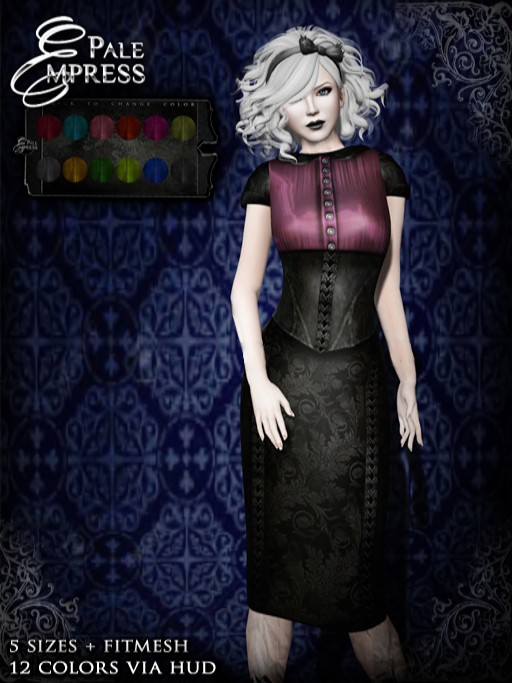 This is a surprising gown full of gothy goodness, ready to adorn you no matter where you choose to sway. There’s a colour-change HUD of twelve colours included with the dress, so you’re actually getting a whole pack of dresses at the price of one! 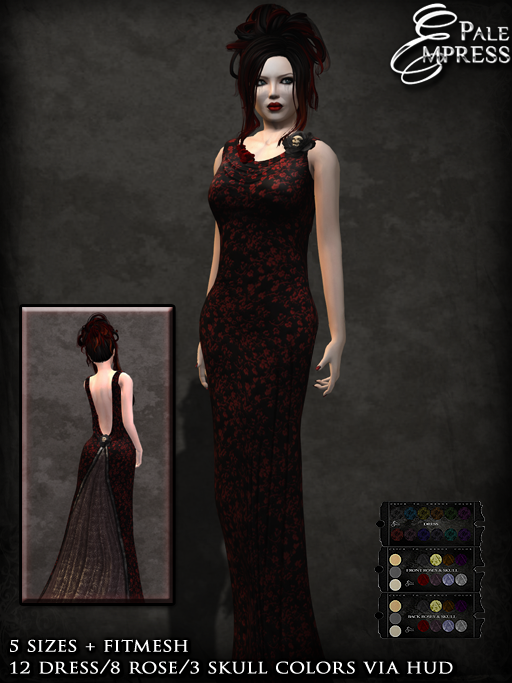 The dress is a rigged mesh item that moves with your avatar. It comes in the five standard sizes plus a fitmesh size. Please try the demo before purchasing. Miss Amanda Jones is an intriguing contrast of preppy and delinquent, pure innocence and laced-up seduction. The top is a properly buttoned up vintage shirt tucked into a tight corset that is followed by a sinfully curve-hugging skirt of slow, sliding movements. This dress challenges the world with attitude and dark vintage style, leaving no question about who is the one in control around here. Snake Dance is an eccentric wrapping for all the women waltzing their own paths. Its classic silhouette is contrasted by the stripes that seem to be tightening around your curves in the most form fitting fashion imaginable. This dress is for those who are never afraid to stand out, for the ones with the slinking cheshire cat spirit, the ones that challenge their environments one stripe at a time.